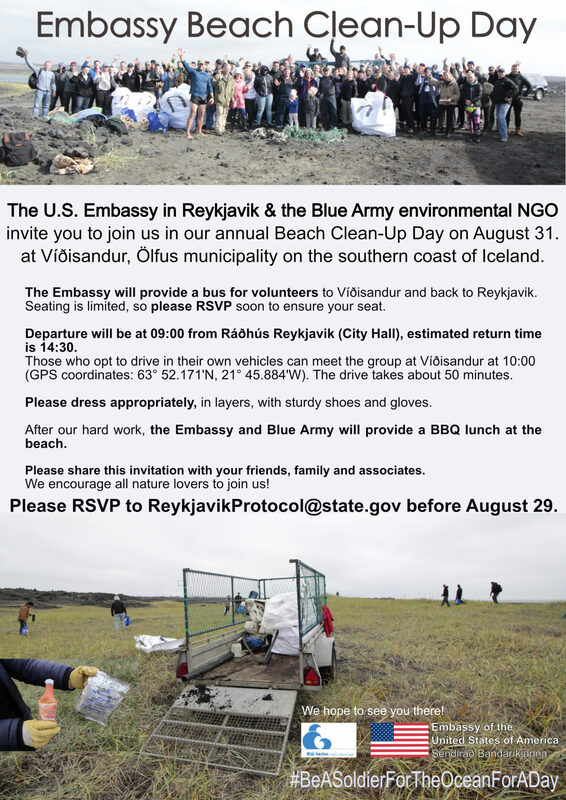 The US Embassy Reykjavik Iceland and the Blue Army environmental NGO are pleased to invite you to join us in our annual Beach Clean-Up Day on Friday August 31. at Víðisandur, Ölfus municipality on the southern coast of Iceland. The Embassy will provide a bus for volunteers to ride to Víðisandur and back to Reykjavik. Seating on the bus is limited, so please RSVP to ensure your seat. Please RSVP to ReykjavikProtocol@state.gov before August 29 to ensure your seat on the bus provide for volunteers to ride to Víðisandur and back to Reykjavik. Departure will be at 09:00 from Ráðhús Reykjavik (City Hall), estimated return time is 14:30. Those who opt to drive in their own vehicles can meet the group at Víðisandur at 10:00 (GPS coordinates: 63° 52.171’N, 21° 45.884’W). The drive takes about 50 minutes, and we encourage carpooling. Please dress appropriately, in layers, with sturdy shoes, gloves and rain/wind layer. After our hard work, the Embassy and Blue Army will provide a BBQ lunch at the beach. We encourage all nature lovers to join us for this important community service event to help protect the environment and practice good environmental stewardship. Please share this invitation with your friends, family and associates. Children are welcome too! Please RSVP to ReykjavikProtocol@state.gov before August 29.